What makes a Spaniard unique within Western civilization? Why is Spain so different from other European countries? Some people look for a simple geographic answer. But the fact is that its geography has not changed that much since the days when Spain, as so many other European lands, was but a piece in the grand imperial mosaic put together by Rome. This common background persisted for several centuries as northern European tribes - Visigoths, Ostrogoths, Franks - overran southern Europe and established themselves there. What really made the difference was the arrival in Spain of the Arabs early in the 8th century. From that moment on, Spains development took on a distinctive character. While it is true that the Arabs also reached up into France, they were soon thrown back. In Spain it was a different story. The Moslems conquered much of the Iberian peninsula and stayed on for nearly eight centuries. Small Christian nuclei in northern Spain resisted the Moslem invaders from the beginning. Over the centuries these rugged groups grew into powerful Christian kingdoms that pushed the infidel ever southward. During this prolonged struggle, Spain served as an advance post for Christianity, a religious frontier. The main performers on this medieval stage were the monk and the warrior - the man who prayed and the man who fought; the man who reflected upon death and the man who faced it on the battlefield. The victory achieved after nearly 800 years of effort gave the Spaniard a feeling of superiority, which was reinforced by medieval chroniclers who were quick to remind them that their country had once given great emperors to Rome. In that long contest Spain put ideological values ahead of purely material interests. Rivers were more often used as moats behind which to fight raiders than as trade routes. Cities sprang up not because of economics but because of strategic imperatives. Such was the case of Segovia; and it was as a guardian of the mountain passes that Madrid had its humble beginnings. This also explains why the Spanish landscape often has a warlike appearance. Any knoll, any mountain pass, any meadow, was a good place to build a fortress-castle. When the Catholic Sovereigns ended the war of reconquest from the Moslems, the Reconquista, and stood at the Moorish towers of the Alhambra at Granada, they once more turned their eyes southward, as Spaniards had done for so many centuries. This time there was only the sea. But that very same year Spanish ships under Columbus succeeded in crossing the great Dark Sea. It was as though Spain, having run out of land to reconquer, had been forced to look beyond the ocean for new lands in which to continue its feats of valor. In a broad sense, the Reconquista grew into the discovery, conquest and colonialization of the New World. It was at this moment that the concept of manifest destiny - so easy to take hold in any country at the height of its power - sank deep into the Spanish conscience. The Spaniard felt he had a godly mission to carry out, and this was to make it possible for him to withstand bitter defeats in later years. When the Castilian Cortes met after the disaster of the Invincible Armada, someone advised the king to abandon his ambitious foreign policy, which had forced Spain to fight against half of Europe. "If they want to ruin themselves, let them," the adviser added spitefully. To have followed this counsel would have amounted to striking the flag that had let Spain on a universal mission. But at that same Cortes another ringing voice was heard. 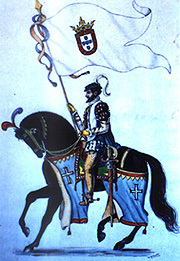 Recommending that the fight be carried on, a representative from Murcia said: "If what we are doing is defending the cause of God - as I am sure we are - then we must not give it up as impossible, for He will discover new Indies for us, as He discovered the Catholic Sovereigns when we needed them." Defeats such as that of the Armada in 1588 were considered God's fair punishment for the sins of Spanish society. Therefore this society must purify itself - without stopping its expansion abroad - so that "the nations of this Europe of ours may once again flourish in Christianity." To the deep sense of mission there was now added a burning desire to re-establish religious unity in Europe. But for one long century before that, from the beginning of the internal restoration undertaken by Fernando and Isabel until the larval stage of the defeatist generation of 1588, Spain had shown a dynamic drive seldom paralleled in history. The Spaniard felt his hour had arrived. He received vast influences from Renaissance currents, both from Italy and the Low Countries. But the fact that he rode on horseback through the lands of the New World was to place him ahead even of Renaissance ideas and to fill him with a proud spirit of progress. New wonders - never even imagined by the ancient Greeks and Romans - came daily before his eyes, and he was impelled to incorporate them into his way of life. For this the teachings of the ancients were of little use. In the words of a Spaniard of the time, the physical features and the customs observed in the new lands "showed how wrong these ancients were in their writings about these areasÉ"
The enormous task of incorporating the New World into Western civilization was carried out by the Spaniards in an incredibly short time. This can only be explained in terms of their eventful medieval past. To the experience gained in the struggle against the Moslems they soon added the discovery of the Canary Islands. This was a small-scale prelude for the venture into the New World, involving overseas action, clashing with primitive cultures, preaching of the Gospel and creation of the new Castillas. Eventually, not only was the New World brought into the fold of Western civilization, but European life was radically changed as a result. Europe entered into a dynamic period of conquest and assimilation for which Spain had shown the way. Yet the Spain of the 16th century, though still preserving its great ideals, evolved slowly. The hidalgos who fought under Charles V in Europe and under Cortés in America were men of action, fond of reading books on chivalry. Under Felipe II they were replaced by a new breed more inclined to discourse than to action. While it is true that the most valuable works of the Spanish baroque, both in literature and in the arts, were crafted after the ArmadaÕs defeat, this did not prevent Spanish society from being afflicted by a dangerous dichotomy. It was then that the underlying internal unity became apparent. This could be attributed largely to a deficiency of adequate organs to bring about the political union of the two former kingdoms of Castilla and Aragón. The difficulties were compounded because the Catholic Monarchy, in addition of the biological creation of an overseas Spanish empire, went on to build a supranational state with vast ramifications in Central Europe. Indeed, at the beginning of the 16th century, the Catholic Sovereigns succeeded in making a modern state out of Castilla by controlling the nobility, insuring the loyalty of the Cortes and establishing new institutions or reviving some old ones. But they failed to persuade the crown of Aragón to integrate its different customs and traditions with those of Castilla. Only in the field of religion were they able to spread a mantle that covered all of the Spanish speaking people. It is difficult to explain why Aragón, which had displayed tremendous energies in the early Middle Ages, now flinched from the enterprises undertaken by the Catholic Sovereigns. Had its will be weakened by the establishment of the Castilian dynasty of the Trastamaras? Was it because of the civil wars and social upheavals of the 15th century? At any rate, the disproportionate forces - both in territory and in population - between Castilla and Aragón at the time of the marriage of Isabel to Fernando resulted in a fierce Castilian arrogance and in a cold indifference, born of deep resentment, on the part of the Aragonese, Catalans and Valencians. The only thing achieved by the marriage was to extend the outer covering of Spanish unity without really having formed an inner structure. There followed a rapid territorial expansion, which brought the supranational Monarchy into being. 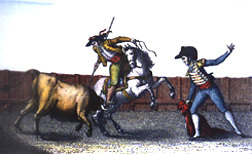 From the very beginning, Castilla played the leading role in it. After expanding its eastern border to the Mediterranean, it found it convenient to embrace the policies of the dynastic Habsburgs and Bourbons, who in turn often proclaimed their preferences for Castilla. But these preferences had a serious and unavoidable result: they inhibited the subjects of the crown of Aragón even in the things at which they were most competent - sailing and commercial enterprises. For hundreds of years these subjects were not allowed to sail to or to trade with the New World. All traffic moved through specific ports in southern Spain. Into this vacuum stepped the sailors and merchants of Genoa and Antwerp. In short, there was always a latent internal weakness that was to become acute at every great national crisis. But at the inception of the Catholic Monarchy Castilla had such vitality that, even without the support of Aragón, it was able to extend its supremacy over a large part of Europe. It had two natural directions of expansion: toward the Western Mediterranean and toward the lands of the New World. In both it was to hold a strong position, reinforced by an awareness of its mission - to contain the Turks in the Mediterranean and to spread Christianity across the Atlantic. Under Charles V, in the early 16th century, Spanish foreign policy underwent a marked shift. Other than Spanish interests came into play. There was talk of an empire with reference to Germanic lands - the Holy Roman Empire - at a time when Castilla was building its own infinitely larger empire across the Atlantic Ocean. As a result of the new policies of the Habsburgs, the powerful old tericos, or infantry regiments, were going to be used far away from their bases. The gold from the Indies was to be squandered in a labyrinth of European religious wars. The conquest of Algiers would take second place to the defense of Vienna; the continued union with the Low Countries would take preference over a greater control of Aragón. Spain not only exhausted its soldiers but also its economy. After the disaster of the Armada and the debacle of Rocroi, the treasury was ruined, the land depopulated, the cities devastated. It is not surprising that, having failed in its attempt to hispanize Europe, Spain would be the object of a campaign by Europe to make it more European. This historical task fell to the Bourbons. To reform, to renovate, to reorganize - these became the new slogans. What started as the work of a foreign king and of foreign ministers soon became the enthusiastic labor of Spanish kings such as Fernando VI and Carlos III, supported by Spanish ministers. The country"s primary need was the reconstruction of its social edifice. It was time to re-examine the old structures with a critical spirit. Spain faced the arduous task of reconciling modernism with tradition. This was the period of the enlightened despots, when the destinies of the nation were placed in diligent and intelligent hands, with remarkable results. Yet everything could be upset if an inept king occupied the Spanish throne. That was exactly what happened with the crowning of Carlos IV, who, in addition to internal problems, had to face the international consequences of the French Revolution and of Napoleon's ambitions. A series of mistakes was to bring on the French invasion of Spain, and the subsequent war of independence. This soon depleted the resources slowly accumulated by good administrators in the 18th century. As a tragic follow-up, incompetent leadership was to bring about the disintegration of the overseas empire. As the 19th century advanced, Spain was reduced to almost its old territory. The Treaty of Westphalia, in the middle of the 17th century, had ended Spanish supremacy over Europe; early in the 18th century, the Treaty of Utrecht deprived Spain of its possessions in Flanders and Italy; our War of Independence brought the pruning down to the very trunk of the tree. Deep ideological differences between liberal and conservative viewpoints came to the surface under Fernando VII. There was no agreement of hoe to cure the country's ills. Many Spaniards looked back to the old political formulas that had existed during the country's finest hours. Others felt that the most urgent task was to bring Spain up to date in accordance with the liberal systems - both political and economic - adopted by Western European countries. A grave dilemma arose. The traditionalists seemed to remove themselves from modern reality; the liberals appeared to want to cut Spains roots in the past. These opposing views launched the country in a series of pronunciamientos and civil wars, at a time when the rest of the Western world was prospering under the industrial revolution. In 1898, the Spanish monarchy, shocked by the loss of Cuba, Puerto Rico and the Philippines, began to stir. Spaniards looked eagerly through every window of knowledge and explored every avenue of literary and artistic creation in a serious effort to join the scientific progress all along the line. The monarchy gave way to a dictatorship and later to a republic. Neither proved to be a durable solution. Spains dilemma of reconciling the past with the present, as a prerequisite for facing the future with confidence, was to remain largely unsolved. Yet, for all these weeds of dissension, the Spaniard knew he carried within himself, ready to flower in the most difficult circumstances, the seed of greatness.